About "Angle relationships in parallel lines and triangles"
In this section, we are going to see the angle relationships, when two parallel lines are cut by a transversal and in triangles. Angles lie on the same side of the transversal t, on the same side of lines a and b.
Angles are nonadjacent angles that lie on opposite sides of the transversal t, between lines a and b.
Angles lie on opposite sides of the transversal t, outside lines a and b.
Angles lie on the same side of the transversal t, between lines a and b. In this section, we are going to see the angle relationships in triangles through the following steps. Draw a triangle and cut it out. Label the angles A, B, and C.
Tear off each “corner” of the triangle. Each corner includes the vertex of one angle of the triangle. Arrange the vertices of the triangle around a point so that none of your corners overlap and there are no gaps between them. What do you notice about how the angles fit together around a point ? The angles form a straight angle. Describe the relationship among the measures of the angles of triangle ABC ? The sum of the angle measures is 180°. What does the triangle sum theorem state ? The theorem states that the measure of an exterior angle is equal to the sum of its remote interior angles. In the figure given below, let the lines l₁ and l₂ be parallel and m is transversal. If ∠F = 65°, find the measure of each of the remaining angles. ∠F and ∠H are vertically opposite angles and they are equal. ∠H and ∠D are corresponding angles and they are equal. ∠D and ∠B are vertically opposite angles and they are equal. 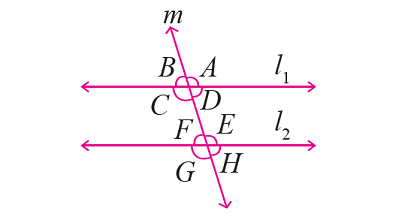 ∠F and ∠E are together form a straight angle. ∠E and ∠G are vertically opposite angles and they are equal. ∠G and ∠C are corresponding angles and they are equal. ∠C and ∠A are vertically opposite angles and they are equal. 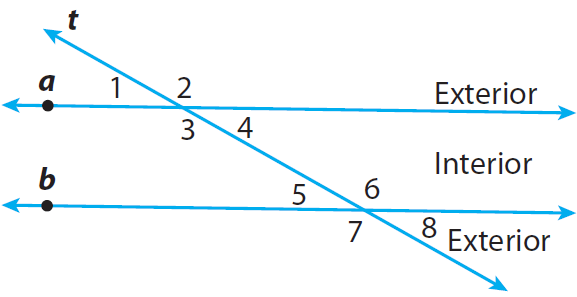 Let us look at the next problem on "Angle relationships in parallel lines and triangles". After having gone through the stuff given above, we hope that the students would have understood "Angle relationships in parallel lines and triangles". Apart from the stuff given on "Angle relationships in parallel lines and triangles", if you need any other stuff in math, please use our google custom search here.